Signature Stairs are predominately metal structures which are timber clad as required after fabrication. A Signature staircase gives a home a sense of openness and luxury and each stairs represents a beautiful combination of functionality and design, combining traditional crafts and modern materials with spectacular results. Our Signature Stairs team includes sales support, surveyors, structural engineers, drawing technicians, fully qualified fabricators, specialist installers & highly skilled joinery partners who ensure the highest possible finish to our stairs. The timber components of each stairs – steps and handrails are made from natural timbers and hand crafted giving each project an elegant uniqueness. When it comes to step cladding and handrails you can choose from a variety of wood finishes from high-grade oak to American walnut and all timbers in between. We only use the highest quality, natural solid hardwood timber from fully sustainable resources. In addition to an extensive range of natural products we offer a large variety of stains, waxes and brushed finishes and in most cases match virtually any existing wood finish. Timber cladding provides an attractive, lasting and durable finish as well as incorporating a ‘bespoke’ traditional element to a contemporary staircase design. All our timber cladding is environmentally sustainable with a highly aesthetic and extremely durable finish. The timber of your choice is finished to the highest standards and coated with 2-part polyurethane low sheen varnish for durability and protection. Timber can also be stained or treated to achieve a particular effect or colour to create a cohesive look throughout your home. In addition, non-slip stainless steel strips can also be added if required. Generally construction of steps consists of 20 mm solid timber. 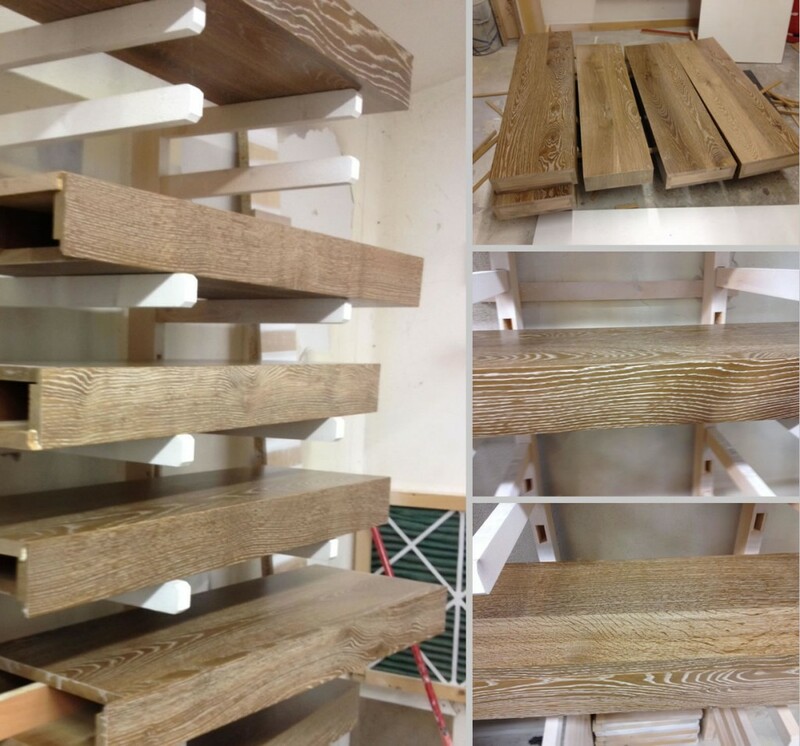 Steps are formed using 3 or 4 x 20 mm planks, by laminating these together, steps are much stronger, more stable and less likely to warp. Where landings are present, depending on size, the planks may be joined rather than laminated using a ‘v’ joint – this accommodates any possible movement which may occur in a larger section. Unless otherwise agreed steps are finished in a low sheen (20%) polyurethane two part lacquer. Step nosings are pencil routed to lessen changes of chipping mitred lead edges. Optional extra – depending on working environs we can also offer acoustic matting to be used under steps. A) A sample of the timber to be provided to our surveyor on day of survey. B) Product name | wood species. C) Supplier contact details if possible. D) Name of stain along with manufactures name and colour reference. E) Method of application i.e. how applied i.e. brushed sprayed or raged. F) Type of lacquer i.e. water based or otherwise, sheen level & finishing. G) If lacquer or stain is supplied by client all application details need to be confirmed. H) Any finishing processes which may affect the look of the finished timber. Please note, not all manufacturers finishes / processes are replicable, ‘smoked’ finishes are specific to the kiln process, width and shape of timber but we are happy to advise on samples provided. CONTACT our sales team today and we’ll be more than happy to guide you through the entire process.